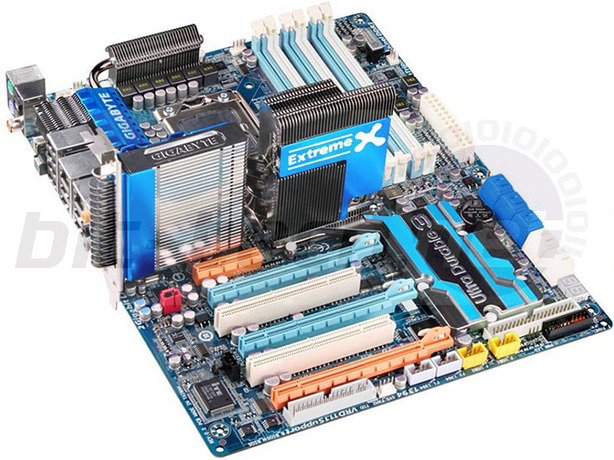 Gigabyte will launch three X58 motherboards in a few weeks – the Extreme, the UD5P and the UD5. All will feature Ultra Durable 3 with Gigabyte’s new 2oz copper layer in the PCB, Dynamic Energy Saver advanced, 50-squillion hour Jap caps and Dolby Home Theatre audio with the premium Realtek AL889a sound codec. Style wise, Gigabyte has heard our (and others) concerns and updated its design massively, with a largely positive effect. While adamant that it doesn’t want to follow down the “black PCB = enthusiast” route, we think its blue-white-silver approach looks really something fresh. 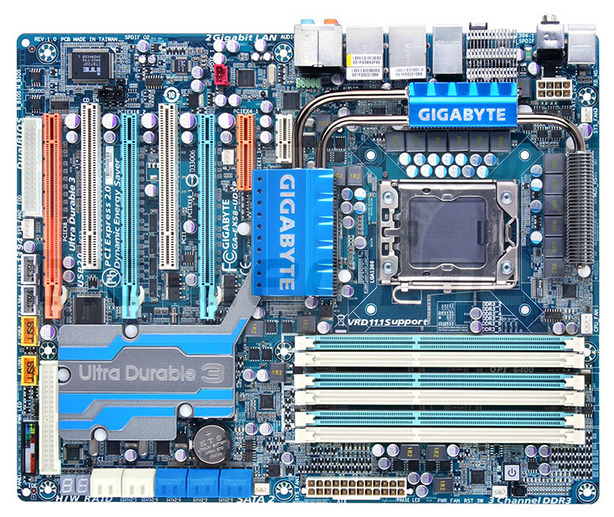 While I personally would have loved Gigabyte to have gone that much further and make the USB pin-outs blue and orange slots silver/grey, overall we feel the change is certainly a step forward. Drop in some ambient blue and white lighting in a case and this could look pretty pimped out. Technically though we have some questions - the whole heatpipe array is simply push-pin restrained on the UD5P below, although we hope the Extreme has proper screws, and the huge (cool looking) southbridge mass has more compression than the northbridge strangely enough. Other features for the series include dual Gigabit LAN, 4-pin and 6-pin Firewire connectors on the rear I/O as well as eight USB 2.0 ports, 10 SATA, dual BIOS and an Ultra TPM module. What is still missing is that extra mile certain other companies have gone to with their X58's - we feel in some respects that Gigabyte is so afraid of copying the competition it's effectively limiting itself in what it can offer. This goes for Gigabyte or anyone else, and at the end of the day, if a feature benefits the consumer - we want to see everyone doing it in their own way. The Extreme will feature not only a massive set of optional cooling fins that clips into a PCI bracket, but also a watercooled northbridge option too. However, while... very large, we remain slightly sceptical about how all those heatpipes efficiently connect to the northbridge and in what direction exactly the fins are expected to be cooled. Does this look better than what we previously looked at? Let us know your thoughts in the forums.